New high-tech, energy-efficient liquor store opens in Davis County. It has an ‘impressive’ wine cave but no cold beer. (Leah Hogsten | The Salt Lake Tribune) Utah's newest State Liquor and Wine store features a wine "cave" and clear product placement and signage to help customers with their purchases Monday, March 11, 2019, in Syracuse. The store has eco-friendly technology that will result in lower operating costs and lower energy and water usage. Syracuse • Utah’s 46th liquor store, which opened Monday in a rapidly growing section of Davis County, is high-tech, energy efficient and the first to have a wine cave. Yet customers still won’t find cold beer. It will be open Monday through Saturday from 11 a.m. to 10 p.m., excluding holidays. Leah Hogsten | The Salt Lake Tribune Utah's newest State Liquor and Wine store features a wine cave and clear product placement and signage to help customers with their purchases Monday, March 11, 2019 in Syracuse. The store has eco-friendly technology that will result in lower operating costs and lower energy and water usage and cost $5.4 million dollars. Leah Hogsten | The Salt Lake Tribune Utah's newest State Liquor and Wine store opened Monday, March 11, 2019 in Syracuse. The store has eco-friendly technology that will result in lower operating costs and lower energy and water usage and cost $5.4 million dollars. Leah Hogsten | The Salt Lake Tribune Utah's newest State Liquor and Wine store opened Monday, March 11, 2019 in Syracuse. The store has eco-friendly technology that will result in lower operating costs and lower energy and water usage and cost $5.4 million dollars. Leah Hogsten | The Salt Lake Tribune Jim Glenn, manager of Utah's public art program, snaps a picture of the art installation in Utah's newest State Liquor and Wine store in Syracuse on Monday. The installation titled Shoreline Birds by Day Chirstensen correlates to Utah's bird flyway through Syracuse to the Bear River Migratory Bird refuge. The store has eco-friendly technology that will result in lower operating costs and lower energy and water usage and cost $5.4 million dollars. 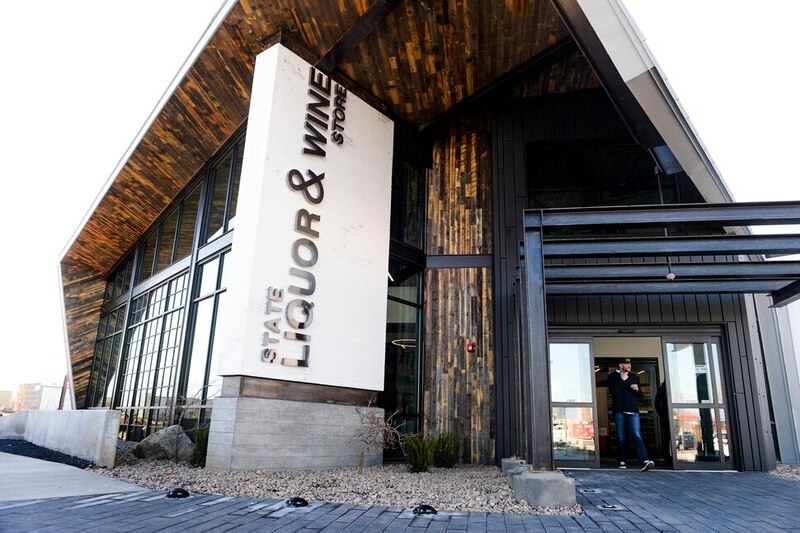 Leah Hogsten | The Salt Lake Tribune Utah's newest State Liquor and Wine store features clear product placement and signage to help customers with their purchases Monday, March 11, 2019 in Syracuse. The store has eco-friendly technology that will result in lower operating costs and lower energy and water usage and cost $5.4 million dollars. Leah Hogsten | The Salt Lake Tribune l-r Syracuse State Liquor and Wine store assistant manager Jacen Moore and manager Yumi Finney look over the store's new inventory in the wine cave Utah's newest State Liquor and Wine store opened Monday, March 11, 2019 in Syracuse. The store has eco-friendly technology that will result in lower operating costs and lower energy and water usage and cost $5.4 million dollars. 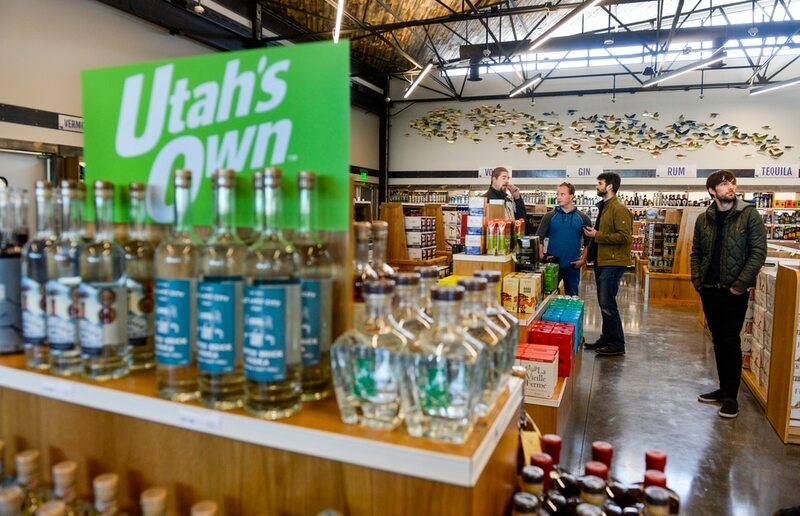 Leah Hogsten | The Salt Lake Tribune Utah's newest State Liquor and Wine store has a larger checkout area to help customers with their purchases Monday, March 11, 2019 in Syracuse. The store has eco-friendly technology that will result in lower operating costs and lower energy and water usage and cost $5.4 million dollars. Leah Hogsten | The Salt Lake Tribune State Liquor and Wine store employee Tony Checketts checks inventory Monday, March 11, 2019 in Syracuse. The store has eco-friendly technology that will result in lower operating costs and lower energy and water usage and cost $5.4 million dollars. Leah Hogsten | The Salt Lake Tribune Utah's newest State Liquor and Wine store features a wine cave and clear product placement and signage to help customers with their purchases Monday, March 11, 2019 in Syracuse. The store has eco-friendly technology that will result in lower operating costs and lower energy and water usage and cost $5.4 million dollars. Leah Hogsten | The Salt Lake Tribune Utah's newest State Liquor and Wine store features a wine cave and clear product placement and signage to help customers with their purchases Monday, March 11, 2019 in Syracuse. The store has eco-friendly technology that will result in lower operating costs and lower energy and water usage and cost $5.4 million dollars. 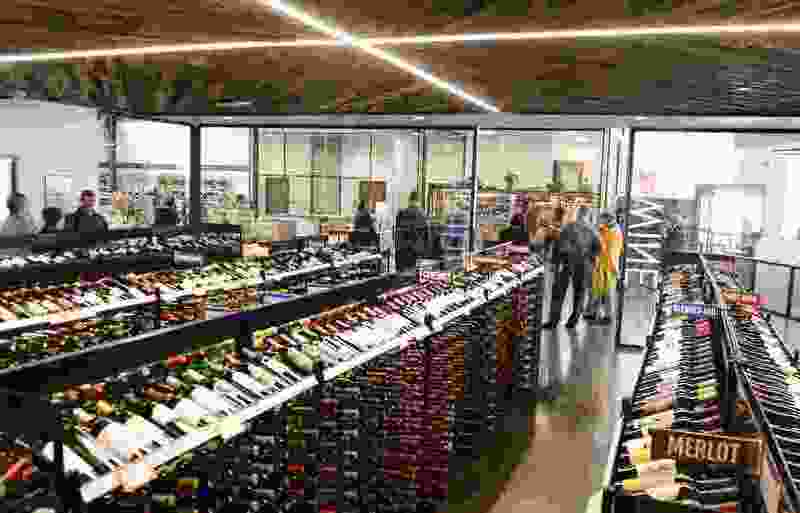 Leah Hogsten | The Salt Lake Tribune Utah's newest State Liquor and Wine store features a wine cave, wine magazines to consult and informational signage to help customers with their purchases Monday, March 11, 2019 in Syracuse. The store has eco-friendly technology that will result in lower operating costs and lower energy and water usage and cost $5.4 million dollars. 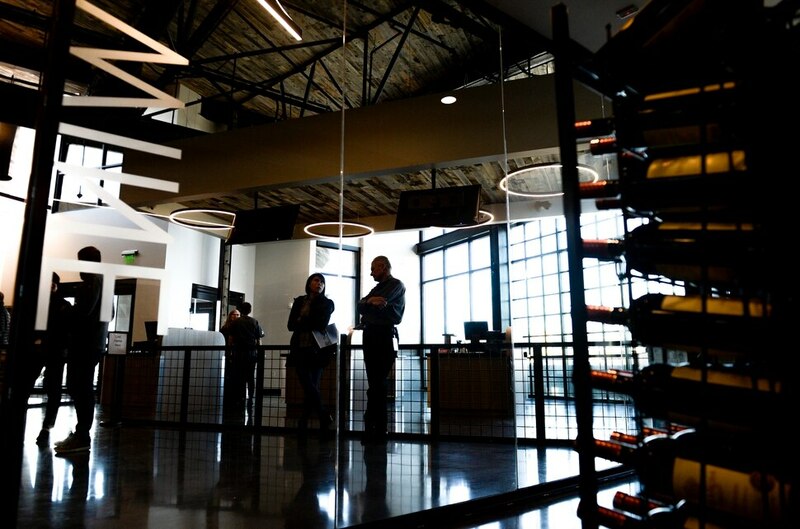 Leah Hogsten | The Salt Lake Tribune Utah's newest State Liquor and Wine store features a wine cave, wine magazines to consult and signage pairing food to wine to help customers with their purchases Monday, March 11, 2019 in Syracuse. The store has eco-friendly technology that will result in lower operating costs and lower energy and water usage and cost $5.4 million dollars. With energy-efficient heating and air conditioning and LED lighting, the store’s annual utility costs are expected to be about 34 percent less than similar buildings of that size, Meier said. Low-flow water fixtures inside along with native plants and a drip-irrigation system outside should reduce water consumption by about a third. The building’s block shape and glazed north windows will block the evening sun during the summer months, providing natural light and protecting merchandise from harmful ultraviolet light. Construction began last July, Meier said. Once completed in late February, products — enough to fill seven semi-trucks — were brought in to fill the shelves. The offerings include about 40 percent wine and 40 percent spirits. The remainder is beer that is higher than 4 percent alcohol by volume (or 3.2 by weight). Beer that has less alcohol is sold in Utah grocery and convenience stores. The DABC has redesigned liquor store signs to help customers quickly find desired products. A wine cave along the east wall provides wood accents, reminiscent of wood casks. There are no windows and the space is slightly cooler, as light and extreme heat can damage delicate wines. The front of the store features a “Utah’s Own,” section stocked with beer, wine and spirits made in state. Point-of-Sale technology, being installed in DABC stores throughout the state, should make accounting, product ordering and overall management of the store more efficient. Store shelving has a modular design, allowing better placement of products that sell quickly. Anne and Maurice Greeson were among the first customers to enter the new Syracuse store — which is located next to a Smith’s Food and Drug store but slightly hidden behind a McDonald’s — when it opened at 11 a.m. The Syracuse residents enjoy wine and say they previously drove to Bountiful and Salt Lake City to get the selection they want. One thing missing from the new store — and all Utah liquor stores — is a way to refrigerate the beer sold in the state-run retail outlets. It was one of the top customer complaints in a recent DABC store survey. While it may be difficult and expensive to add refrigeration to old stores, why not add the feature with new construction? “It’s just conjecture on my part,” said DABC Executive Director Sal Petilos, “but we don’t want to be in competition with stores in the private sector." The last state liquor store to open was in 2017 in West Valley City. But the DABC and the Legislature have been working on adding stores more rapidly. Herriman — A liquor store is under construction in a development area at 11800 South and Mountain View Corridor. Tentative opening is summer 2019. Central Davis County — The agency is searching for land in the Farmington-Kaysville-Layton area to build a store. Utah County — The DABC is looking for land in the Saratoga Springs area for a store. The DABC has asked the Legislature for nearly $11 million to replace Salt Lake City’s downtown liquor store on 400 South. The 37-year-old Salt Lake City store at 1615 Foothill Drive also will be rebuilt as part of a redevelopment project. Even when those outlets open, it barely will make a dent in Utah's liquor store needs. The state needs at least 12 more stores in targeted areas — specifically along the Wasatch Front — to keep up with alcohol sales and a growing population, according to a study conducted by Zions Public Finance, a division of Zions Bank. Utah's population, currently at 3 million, is expected to jump to 3.9 million by 2030 and 4.5 million by 2040, the study shows. The state could have as many as least 63 liquor stores under a legislative formula allowing for one liquor store for every 48,000 residents. The DABC and lawmakers have tried to add at least one new liquor store a year, but cities often are unwilling to host the outlets — something officials have found surprising because liquor stores bring in millions in tax dollars to local communities.